Diabetes is a serious threat to global health. Last year, diabetes was responsible for an estimated four million deaths according to figures from the International Diabetes Federation (IDF). Many of these deaths could have been prevented or delayed. Our current projections suggest the number of people with diabetes will increase to 522 million over the next decade, equivalent to one in ten people. Diabetes does not just affect individuals. It affects entire families. Today, diabetes concerns every family – from the parents of children with diabetes to those caring for an older family member and to those with a relative or loved one who is at high risk. It is fair to suggest that most of us know somebody living with diabetes. With the rising healthcare and societal costs associated with diabetes – USD 727 billion in direct medical costs alone in 2017 – we must think about how the increasing prevalence of diabetes, especially type 2, and its related complications can be slowed down, prevented and, hopefully, reversed. It is an ambition that will require a whole-of-society approach. 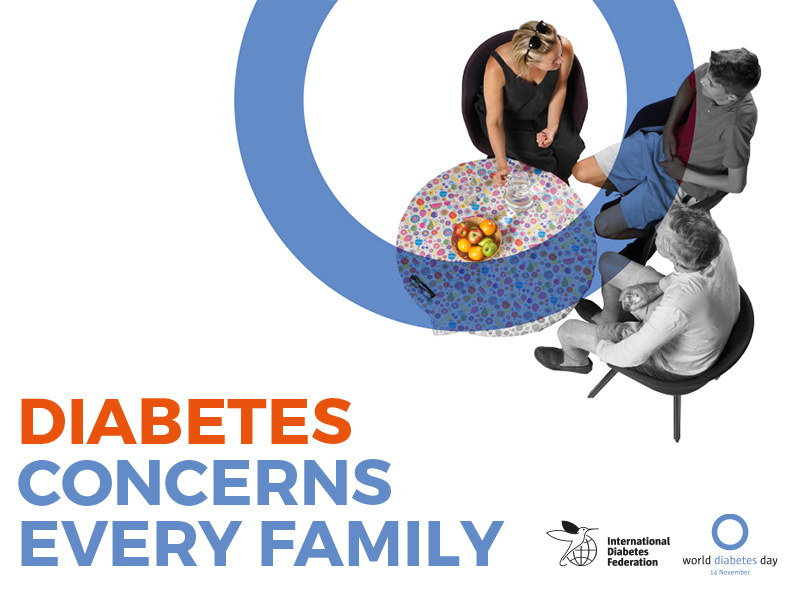 We all have a role to play but governments, in particular, need to do more to help us protect family members from developing type 2 diabetes and its life-threatening complications and ensure that people with diabetes have access to the medicines and care that they require to stay healthy. Of all people living with diabetes, around 10 percent have type 1 diabetes. This type of diabetes has to be treated with insulin. At present, there is no way to prevent type 1 diabetes. If untreated, the diagnosis of type 1 diabetes is a death sentence. This leaves around 90 per cent, an estimated 382 million people worldwide, with type 2 diabetes. In many cases, up to 80 percent according to some figures, type 2 diabetes can be prevented through regular physical activity and healthy eating habits. Unfortunately, type 2 diabetes flies under the radar. Onset can be slow and the warning signs and symptoms not obvious. In fact, one-in-two of all people currently living with diabetes remain undiagnosed. Governments can help stop the rise in type 2 diabetes by focussing on education initiatives and establishing polices that support improved lifestyle and dietary choices. They need to identify people who are not yet diagnosed and those at high risk so that the medical community can intervene early, before people are left needing treatment for diabetes complications when it is already too late. Diabetes is a leading global cause of blindness, lower limb loss, heart attack and kidney failure. More than two thirds (70%) of premature deaths amongst adults are often caused by behaviour that starts during adolescence. It is critical then that we get into the learning environment to educate children and young adults about the behaviours that can lead to type 2 diabetes. It is critical we influence the adoption of habits that will facilitate prevention and create environments that encourage health. It is critical we work with parents to help them provide their children with a blueprint for a healthy future. Only 17 percent of people think their government is doing enough to tackle diabetes. The diagnosis of diabetes can be difficult for the individual. The impact diabetes can have on a family is often overlooked. Families have a significant role to play in supporting any family member with diabetes to help that individual to manage their condition. While the diabetes epidemic has become a concern for the public, there is also a strong perception that those in a position to bring about change are not taking the right steps to prevent this non-communicable disease from drastically effecting lives. IDF recently asked people across the globe to evaluate the governmental response to diabetes. “Does your government have a responsibility?” We asked. “Is your government doing enough?” Globally, 44 percent of people believe that their government has a responsibility to provide diabetes care. But only 17 percent think their government is doing enough to tackle the disease. With the majority of cases of diabetes preventable, there are significant cost savings to be made by investing in education and prevention. If governments were to do more, such as providing guidance to the one-in-five health professionals who have not received postgraduate training on diabetes, they would support the prevention, early diagnosis and treatment of diabetes and its complications, helping to build a more sustainable future. As a consequence, they would spend less money on treating people with diabetes when it’s already too late. This could be money saved and misery avoided. We firmly believe that people with diabetes and their families should have regular and affordable access to the care, education and support that is required to live a full and healthy life with the condition. At IDF, we campaign constantly for diabetes to be put at the top of the global health agenda so that it receives the attention that its serious and far-reaching impact deserves. The research we have done in both developing and high-income countries shows the global population is demanding more action to treat and prevent diabetes, with the introduction of new lifestyle-led initiatives having the added long-term benefit of reducing medical expenditure. Diabetes is a serious problem and it is not going away. Governments can go a long way to prevent the unnecessary death and disability of millions of people across the world. We need to work together to make the changes today that will protect the health of families tomorrow. IDF World Diabetes Day 2018 Report, Arlington Research, August 2018. Available on request.